The first in a series of books based on our project research is out now. 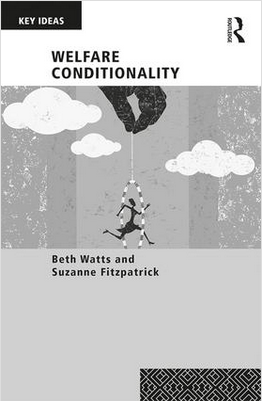 Welfare Conditionality by Beth Watts and Suzanne Fitzpatrick from Heriot-Watt University will have its official launch during our international conference in June. 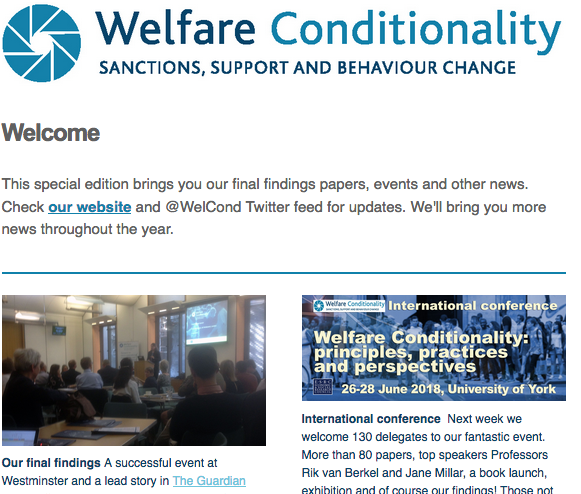 Welfare conditionality has become an idea of global significance in recent years. A hot topic in North America, Australia, and across Europe, it has been linked to austerity politics, and the rise of foodbanks and destitution. In the Global South, where publicly funded welfare protection systems are often absent, conditional approaches have become a key tool employed by organisations pursuing human development goals. The book charts the rise of behavioural conditionality in welfare systems across the globe, its appeal to politicians of right and left, and its application to a growing range of social problems. Crucially it explores why, in the context of widespread use of conditional approaches as well as apparently strong public support, both the efficacy and the ethics of welfare conditionality remain so controversial. As such, Welfare Conditionality is essential reading for students, researchers, and commentators in social and public policy, as well as those designing and implementing welfare policies.